The people who make printer cartridges must see us coming and laugh all the way to the bank. 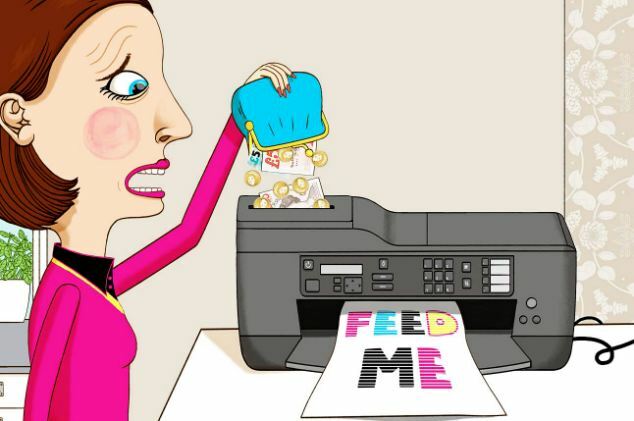 As many have discovered to their horror, refills are so exorbitantly expensive that printer ink costs far more drop for drop than fine Champagne, vintage port or Chanel No 5 — a typical family running a busy printer can easily spend £200 a year on ink alone. If you think that you are getting through ink cartridges more quickly than ever, you are probably right. Over the past decade manufacturers have actually reduced the amount of ink inside them. At the same time they are making it as hard as possible for shoppers to buy cheaper second hand, recycled and refilled cartridges. In a world of scams, dodgy deals and consumer cons, surely the great computer ink rip-off is one of the most galling. We never used to have this much trouble with typewriters. The ribbon in my first old-fashioned manual lasted years. But the days when companies sold long-lasting products that rarely needed replacing or servicing are gone. The 21st century business model is to initially sell consumers stuff on the cheap — and then force us to come back again and again for outrageously pricy accessories. 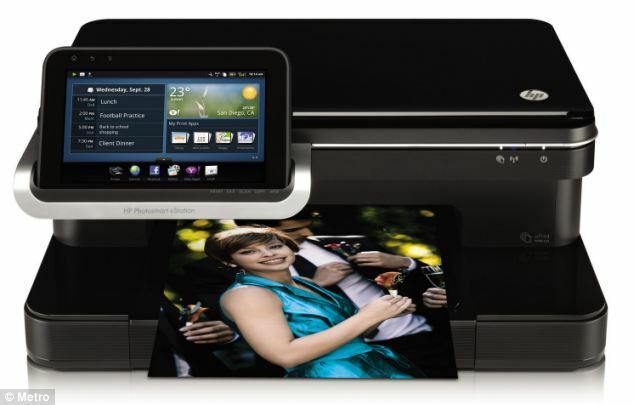 This week Tesco are advertising an HP all-in-one inkjet printer, copier and scanner for less than £30. It’s a fantastic bargain. But what the purchaser may not appreciate is that the two ink cartridges that work with the printer cost at least £20. Within a few months the owner will have spent twice the cost of the printer on ink. The printer ink industry insist their prices are reasonable. A cartridge isn’t just a plastic box with ink, they say, it’s a sophisticated device that sprays the ink on to paper and cleans itself. That may be true. But it’s also true that the ink inside those sophisticated cartridges is being sold in ever tinier quantities. Chris Brooks, of the UK Cartridge Remanufacturers Association — the trade body for the refurbishing industry — says the amount of ink in cartridges has fallen in the past decade, even though they look the same size. In 2004, HP’s best-selling cartridge, the HP45, had 42ml of ink and cost £20. It could print, according to HP’s website, 930 pages. Today, the same company’s best-selling HP300 has just 5ml and sells for £13. It manages only 200 pages. You don’t need to be a computer wizkid to work out that doesn’t represent great value for money. Epson’s T0322 cartridge, released in 2002, contained 16ml of ink. The TO89, which came out six years later, has 3.5ml of ink. ‘The way the consumer is being treated is a massive rip-off,’ said Mr Brooks. Last year, Which? uncovered another problem with cartridges. It found that some brands of printers use up far more ink than others because they keep on running pointless ‘cleaning cycles’. When some printers are turned on, they clean the cartridge’s nozzles by running ink through them and splattering it on to an absorbent pad within the printer. The cycle is supposed to keep the tiny nozzles free of dirt. But it means that people who leave their printer on, or who print masses of documents in one go, use less ink than people who turn their printer off and on and who print the same number of documents over several weeks. Some printers use four times as much ink when they are turned off between jobs. Once the chip has decided the cartridge is empty, the cartridge is useless — and the chip has to be replaced before the cartridge can be used again. The trouble is that computer companies try to make sure that, if recycling companies replace the chips, their printers will either refuse to work, declaring that the cartridge must be a counterfeit, or flash up signs on the computer, warning that the ink cartridge could cause irreparable damage. The manufacturers insist there is no rip-off. A spokesman for Canon said, bafflingly, that reducing the amount of ink in cartridges did not mean they were worse value for money. Epson questioned the quality of some non-branded cartridges and warned that they could reduce the life of a printer. And it too insisted it had cut the amount of ink in its cartridges because they were now more efficient. So what can we consumers do, short of going back to typewriters and ink quills? For a start, it’s always worth buying the XL versions of ink if they are available. They may be expensive — but page for page they do work out slightly cheaper. And you can save 20 to 70 per cent shopping around for refurbished, second-hand refills in supermarkets, office supply stores or online. Sometimes you can just ignore warning messages on your screen, but occasionally a printer will refuse to use a refilled cartridge. The solution to this problem varies from model to model so search the internet for tips on how to get it working. And do be careful about DIY refill kits available from supermarkets. An ink cartridge ideally needs cleaning out before it is reused, and you may find the quality of printing goes down if you refill them at home. If you’re buying a printer, check the cost of the refills. And avoid printers that have ‘three-in-one’ colour cartridges — it’s cheaper to buy the three colours, cyan, magenta and yellow, as separate refills. Of course, the only way to challenge the ridiculous cost of printer refills is to complain by writing hundreds of letters to consumer groups and MPs and industry types. But unless you’re made of money, it’s probably best to use a pen.